gluten-free nanaimo (a.k.a. vameeno) bars | gluten-free glory! 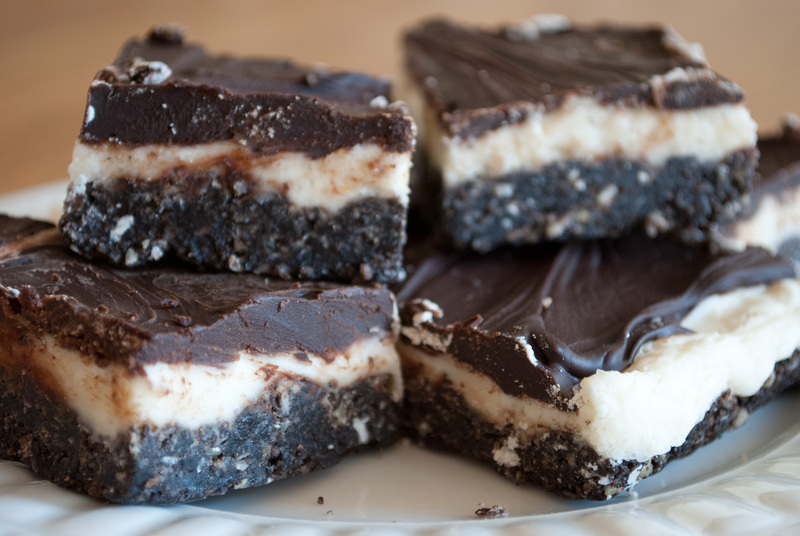 This is an adaptation of a gluten-full and dairy-full nanaimo bar recipe a friend of mine found online. I never knew they were called “nanaimo bars” until I walked into a favorite Baltimore coffee shop (One World Cafe in Baltimore) and saw a gluten- and dairy-free version of my favorite Christmas dessert EVER! Growing up, my family called these “Vameeno” bars – what my mom called my great-grandmother’s “vanilla bars” when she was little – and I thought they were just a family recipe. Turns out I was wrong (thankfully so! ), and now the gluten-free version has returned as a holiday favorite with my family – one we can all enjoy! The bolded ingredients are the GF/DF substitutions, and the ingredients in parentheses are from the original recipe. The dairy free substitutions are delicious, but if you prefer butter over coconut and milk over almonds, make it with the dairy! I still used coconut oil in the crust to bring out the coconut flavor. Preheat oven to 350 degrees F. Line a 9-inch square pan with foil. In a large mixing bowl, stir together melted coconut oil (butter), sugar and cocoa. Stir in egg and vanilla. When smooth, add crumbs, walnuts and coconut. Press crumb mixture tightly into the pan and bake for 10 minutes. Let cool completely. In a mixing bowl, stir together coconut oil (butter) and powdered sugar, then beat with an electric mixer until fluffy. Beat in vanilla, pudding mix and almond milk (milk). Spread the filling over the cooled crust, then chill for about an hour. Prepare topping. Melt the coconut oil (butter or shortening) with the chocolate chips. Pour over top of bars and chill just until the bars start to set. Before the chocolate gets too hard, score the bars into squares. your whole blog is awesome. Oh, I love, love, love these bars. I need to make them again. I only ever had the gluten- and dairy-free version, so I don’t even feel the need to make them the “normal” way! Your adaptation of these was one of the highlights of my year, Becky! And my family’s super thankful for it, too 🙂 I’m hoping to make a second batch sometime in the near future; I have all the ingredients, but just have to make the time for it!